National Park Berchtesgaden is the only alpine national park in Germany. This diverse, rich and beautiful scenery has been declared a biosphere reserve in 1990 by UNESCO. The protected area covers an area in the southeast province Bavaria, and bordering the Austrian province Salzburg. German Park Berchtesgaden is only just over 20 km away from Salzburg. Berchtesgaden can be reached by land from airport Munich, and the road to the reserve is about 200 km. There are options to arrive by car or by train and bus from both Munich and Salzburg. The region of Berchtesgaden consists of steep rocky mountains, dotted with huge rocks and strongly incised gorges and glaciers. In the lower areas are mostly views of dense forests, lush pastures and picturesque valleys. During spring to autumn here flora and fauna is at its peak. Very rare species inhabit the reserve, including the bearded vulture, golden eagle and others. Among mammals, here can be seen the alpine antelope griffin vultures, deer, foxes and others. These southern alpine areas are part of Bavaria since the early Middle Ages. 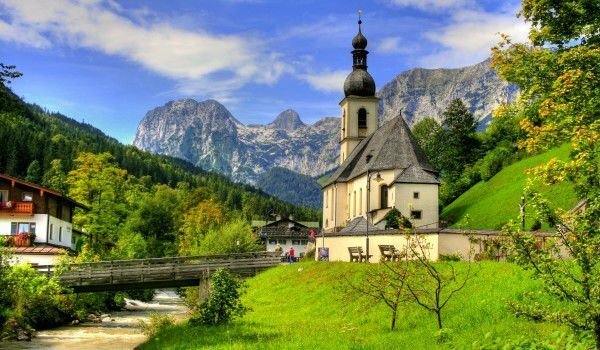 Then in 12-13 century Berchtesgaden town was built. It is located north of the border of the national park. Since 1102, the town exists since it has passed though control by French, Austrian and Bavarian governments. Here the salt deposits are very rich and a salt mine in the town is visited by around 40 000 visitors every way year. The reserve itself is located on 210 square kilometers, including various natural objects. Here is the beautiful glacial lake Köningsee, which has a size of 5.2 sq. km. It is surrounded by majestic mountains, one of which is Watzmann. Its highest peak reaches 2713 meters altitude. Kehlstein Peak is known for its Kehlsteinhaus building that was built to celebrate the 50th anniversary of Hitler.